Parliament was engulfed in turmoil today with the members of the United National Party (UNP) and the joint opposition trading blows and exchanging unsavoury words over differences with regard to the tabling of the Presidential Commission of Inquiry (PCoI) report on the Central Bank bond. Parliament met yesterday for a special session to discuss the CB bond transactions. 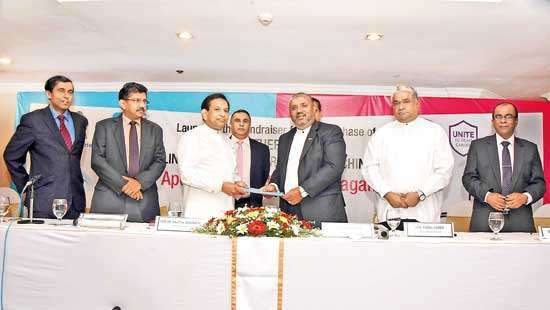 At the start of business, Speaker Karu Jayasuriya announced that President Maithripala Sirisena had agreed to make available copies to the House in a week. 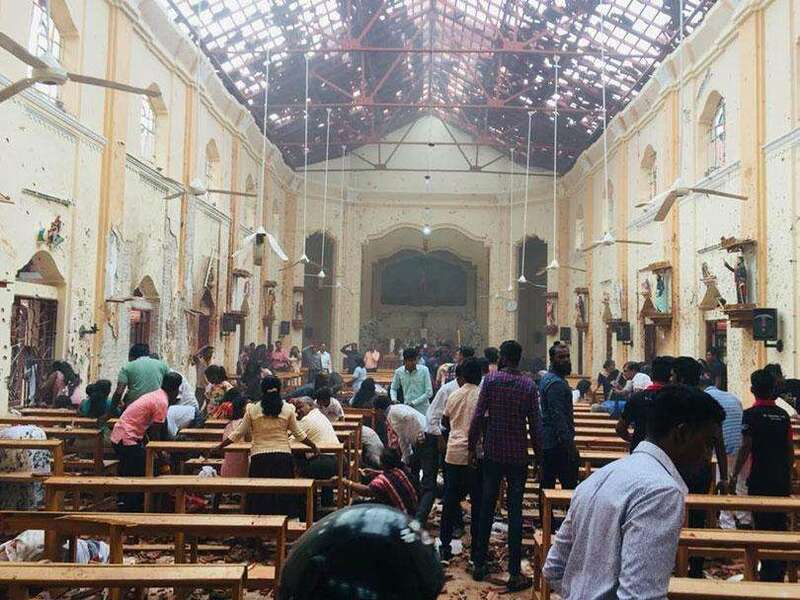 However, the three main political groups in the Opposition -- the Tamil National Alliance (TNA), the joint opposition and the Janatha Vimukthi Peramuna (JVP) were not agreeable to this. JVP leader Anura Kumara Dissanayake, who is also the Chief Opposition Whip, said the Employees Provident Fund (EPF) which hold the savings of the workers had lost as much as Rs.8.5 billion in the larges ever financial fraud committed in this country and therefore the report should be submitted to the House without any further delay. “We have also sought a report under the Right to Information Act. It means we should be given a copy by January 15. Today is January 10. One cannot say the President’s Office is not ready now. Therefore, there is no reason for the presidential secretariat to delay giving the copies. If the President has referred the report to the Bribery Commission and the Attorney General’s Department, then why can’t it be given to the House? The House is above them all,” he said. His position was widely accepted by joint opposition’s parliamentary group leader Dinesh Gunawardane. He said the Speaker assured them the other day that a copy would be made available to the House yesterday. He asked the Speaker to order the Presidential Secretariat to release the report to the House immediately. “We even agreed at the party leaders meeting that the English version would suffice for the time being. Parliament is supreme. That is the position upheld by all the past Speakers. Once former Speaker Anura Bandaranaike upheld that even the Supreme Court could not overrule Parliament. Former Speaker Chamal Rajapaksa upheld that view. We have heard that a report is available with the Attorney General. He is an official answerable to the House. 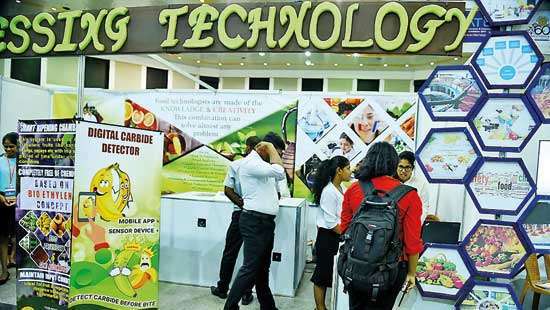 We can engage him now,” Mr. Gunawardene said. 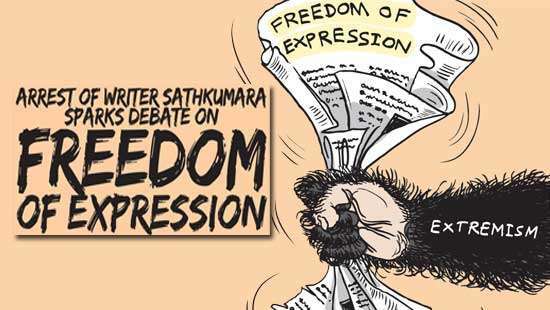 TNA and Opposition Leader R. Sampanthan said the debate should take place at the earliest. “There is no dispute over that. This is a report the country is interested in seeing. We must debate it and get to the root of it,” he said. TNA MP M.A. Sumanthiran also endorsed what the JVP leader said and said a report should be available by 1.30 p.m. The Speaker responded saying the president’s office had agreed to send it within a week and asked the members not to create a rift between him and the President. At this point Prime Minister Ranil Wickremesinghe stood up to make a statement. Mr. Gunawardane raised objections saying the Prime Minister should not be allowed to make a statement in the absence of an overall debate. However, the Speaker allowed the Prime Minister to go ahead with his statement. At this moment, the members of the JO started demonstrating displaying posters and condemning the bond scam. They walked into the Well of the House and moved towards the Speaker. 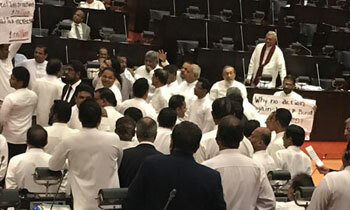 Just then Polonnaruwa district UNP MP Sydney Jayaratne and some others like Hector Appuhamy confronted the protesting MPs and snatching their posters. It led to a tense situation, leading at times to the members on both sides of the House exchanging fisticuffs. UNP MP S.M. Marikkar had nearly exchanged fisticuffs with JO MP Gamini Lokuge. Amid the din the Prime Minister made his statement and subsequently, the House was adjourned. Meanwhile, there was further tension after Mr. Marikkar who arrived in the Chamber after the House was adjourned and slapped Mr. Lokuge who was standing in the aisle. UNP MP Chaminda Wijesiri also began to hit Mr. Lokuge provoking the other JO members to thrash Mr. Wijesiri. What a good comment. Couldn't stop myself laughing. Totally agree with you this is what happens when uneducated idiots enter parliament sad to see. Yes, as you said we should forgive them now and should teach them an unforgettable lesson by not electing them next time. education is one thing, robbing public money is another thing. don't mix it up and divert the attention elsewhere. the topic is bond-scam and broad day light robbing. Thugs starving to grab power. This is what happened when we send idiots to the parliament? they are worse than baboons? Totally agree with you. So sad what has happened to our beautiful country. This is the phohottuwa trying to bloom. Sorry mate, do not disgrace the baboons. They behave like currupt humans. we are one of the highly literate country in south east- asia, but we keep on sending uneducated people to the parliament. They all should be sacked and next in line should be appointed as new MPs as part of punishment. They are a disgrace to the nation. The next in line is no better. Sorry Harasha! This is what happens when Ali Baba clash. This happened before and no disciplinary action was taken. Sack all involved and bring dignity to the legislature. NOT DISGRACEFUL HARSHA, THIS IS INHUMAN AND ANIMISTIC. It is even more disgraceful when you defend multi-billion rupee robbers. You mean Rajatuma and his thieves ? So why not participate the debate peacefully. There was no debate to participate. That’s the whole point. Ranil has blocked the bond report tabling in parliament. So why did the parliament summon in the first place? Most of the MPs in the Parliament are uneducated thugs! Punish the people who elect these thugs.The only solutions is to disenfranchise the Srilankans. Funny how we didnt see your tweets calling the bond scam a "disgrace"
How these people going to develop the country. OMG, WHERE WERE THOSE SWORDS BROUGHT BY GAMMANPILA GANG. JO shows their worth for next elections. People should wary these thugs. Party Leaders must oust these chaps from their parties and make them to tender their resignation from parliament. When the party leaders are themselves the ones who are creating these situations. Then whats the point. Dear Minister, isnt it a disgrace to remain in power after uncovering every thing, inst it disgrace to put foot notes to protect culprits? There are only a few MP's who can engage in a meaningful debate in respectable manner in Sri Lanka parliament. - Harsha, Eran and Hakeem. I don't know Harsha personally but I really admire his debates. Not only our airline but the government should be handed over to another country to manage. These narrow-minded, uneducated so-called patriots are good enough for eating and drinking only. 50 years before our country had a great reputation, we were economically stable, our passport had a great value and we were able to visit 100s of countries without a visa but today, see the progress and wake up oh ignorant people. it will from bad to worse within next couple of decades. Still the opposition believe in beat and rule policy.Very bad situation. Leaders must show how to lead not to act like as villans. President will give bond report before January end and then no confident motion at end of January against PM by JO. Then Prez wants to appoint a new govt. with new PM Chamal Rajapakse or Champika Ranawaka before FEB .10th election combining UNP, SLFP and JO. This will be a disadvantage to UNP and 62 lakhhs voters. They are the disgraceful lot running this country and we tax payers expect the country to flourish. Those who voted them in must learn a lesson and throw them out next time. Look at how countries like Singapore develop. Not surprised about Gamini Lokuge. He started with Cyril Mathew in 1977, by assaulting with chains at the ACBC and followed up with the strikers at Union Place. Old habbits does not go away. shame ! Shameless disgraceful lot, even Ranil shouting Kauda Hora? Mahinda Hora. Shown on TV. Not surprised about Gamini Lokuge leading the attack. His old habits has not left him. Was the right hand hit man of Cyril Mathew in 1977 and lead from front to attack meeting at ACBC and later on the Bank Strikers at Union Place.He was the inventor of Cycle chain attack. Minister of Education. Pls make the Parliament of Sri Lanka out of bounds for school children immediately. Some one said that rogues and thugs are elected by honest people who do not vote. Very true but what can they do otherwise? You elect an angel and soon he metamorphoses into Satan!!!!!!! Not a good idea. In fact your none cast vote is not just 0 value; it gives the other contestants a positive value. instead vote strategically.